All of these (possibly overused) sayings boil down to the same basic message: it’s vital to live in the present moment. In our current twenty-first century lives, it’s not easy. There’s always something coming up that we need to prepare for or anticipate, and our lives are so well-documented that it’s never been easier to get lost in the past. Given the fast pace and hectic schedules most of us keep, a base level of anxiety, stress, and unhappiness is the new norm. You may not even realize it, but this tendency to get sucked into the past and the future can leave you perpetually worn out and feeling out of touch with yourself. The cure for this condition is what so many people have been saying all along: conscious awareness and a commitment to staying in the “now.” Living in the present moment is the solution to a problem you may not have known you had. You might be thinking that this all sounds great, but what does it actually mean to “live in the present moment?” How could we be living in anything but the present? What is the Meaning of the Present Moment? Why is Being Present Minded Important? Before you start reading this article, I recommend you to download Week 1 of Mindfulness X for free. With this package, you will not just be able to understand mindfulness on a theoretical level, but you’ll also have the tools to apply mindfulness in your work with clients or students. Living in the present is not just an arbitrary term or a popular phrase—it’s a recognized and evidence-backed lifestyle that psychologists are quick to recommend for those struggling with anxiety and stress in their day-to-day life. Being in the present moment, or the “here and now,” means that we are aware and mindful of what is happening at this very moment. We are not distracted by ruminations on the past or worries about the future, but centered in the here and now. All of our attention is focused on the present moment (Thum, 2008). Being present minded is the key to staying healthy and happy. It helps you fight anxiety, cut down on your worrying and rumination, and keeps you grounded and connected to yourself and everything around you. Although it has become a popular topic in recent years, living in the present is not just a fad or trendy lifestyle tip, it is a way of life that is backed up by good science. Being present and exerting our ability to be mindful not only makes us happier, it can also help us deal with pain more effectively, reduce our stress and decrease its impact on our health, and improve our ability to cope with negative emotions like fear and anger (Halliwell, 2017). Living in the now is so difficult because we are always encouraged to think about the future or dwell on our past. Advertisements, reminders, notifications, messages, and alerts are all so often geared towards the past or the future. Think about how often you are busy doing something else, perhaps even fully engrossed in it, when you are jolted out of your flow by your phone’s sudden “ding!” Now, think about how often that message or notification helps you stay present and aware of the here and now. If you’re like me, your response to that is probably “Just about never.” Our phones are incredible pieces of technology that allow us to do so much more and do it so much more efficiently than ever before, but we really need to take a break from our phones at least once in a while. We often edit out the bad parts of our experiences, making our past seem more enjoyable than it really was. We face a lot of uncertainty when we live in the present, which can cause anxiety. Our minds simply tend to wander! It can be tough fighting these factors, but luckily we are not slaves to the tendencies of our brains (Tlalka, 2017). It is possible to overcome our more destructive or harmful urges and make better choices. It’s good to think about the past and future sometimes. Where would we be if we didn’t look back over our past successes and mistakes and learn from them? Where would we be if we never planned for the future or prepared ourselves for what is to come? In both cases, we likely wouldn’t be in a good place. It’s essential to a healthy life to spend some time thinking about the past and the future, but it’s rare that we don’t think enough about the past or the future—usually our problem is focusing too intently (or even obsessively) on the past or the future. One of the aims of mindfulness and a key factor in living a healthy life is to balance your thoughts of the past, the present, and the future. Thinking about any of them too much can have serious negative effects on our lives, but keeping the three in balance will help us to be happy and healthy people. It’s hard to say what the exact right balance is, but you’ll know you’ve hit it when you worry less, experience less stress on a regular basis, and find yourself living the majority of your life in the present. Think about the past in small doses, and make sure you are focusing on the past for a reason (e.g., to relive a pleasant experience, identify where you went wrong, or figure out the key to a past success). Think about the future in small doses, and make sure you are focusing on the future in a healthy, low-anxiety way (e.g., don’t spend time worrying about the future, think about the future just long enough to prepare for it and then move on). Stay in the present moment for the vast majority of your time. Of course, following these guidelines is easier said than done, but it will get easier with practice! It might seem complicated to figure out this delicate balance, but it’s not as complex as it seems. When we engage in mindfulness or present moment meditation, we are not ignoring or denying thoughts of the past or future, we are simply choosing not to dwell on them. It’s okay to acknowledge and label our past- and future-focused thoughts, categorize them, and be aware of their importance. “…we can be present when consciously reflecting on events from the past (as opposed to being caught up, distracted and overwhelmed by the past” (2015). When we are aware and present, we don’t need to worry about getting caught up in thoughts of our past or anxiety about our future—we can revisit our past and anticipate what is to come without losing ourselves. Speaking of worry, present moment awareness is a great way to cut down on how much you worry. Cultivate unselfconsciousness: let go and stop thinking about your performance. Practice savoring: avoid worrying about the future by fully experiencing the present. Focus on your breath: allow mindfulness to make you more peaceful and smooth your interactions with others. Find your flow: make the most of your time by losing track of it. Improve your ability to accept: move toward what is bothering you rather than denying or running away from it. Enhance your engagement: work on reducing moments of mindlessness and noticing new things to improve your mindfulness (Dixit, 2008). 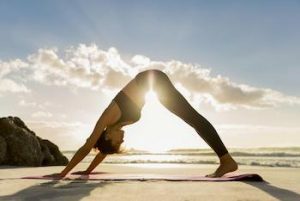 You will probably not be surprised to hear that yoga is an excellent way to get connected to the present and stay in the moment. There are many reasons why yoga is helpful for mindfulness, but one of the biggest is certainly the focus on the breath. “The path to presence is through our mind, body connection—our path is through our breath. 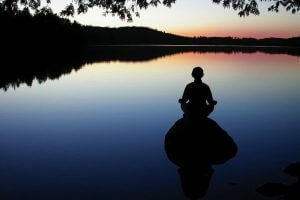 The breath is ALWAYS the here and now, it is the ultimate present moment… Our breath is our constant connection to the here and now, and our presence is rooted in its flow.” (Yokeley, 2014). When we focus our attention on our breath, we have no choice but to be in the present. Breath in and say to yourself, “I am breathing in”, breathe out saying, “I am breathing out.” On your next circle of breath, try saying to yourself, “I am here” coupled with “This is now” (Yokeley, 2014). This simple exercise will bring you straight to the present, even dragging along a stubborn mind that is preoccupied with worries. Another factor associated with yoga that allows us to boost our present moment awareness is the postures and poses that we make with our bodies. You might find that as soon as you get into a good pose, your mind becomes flooded with restless thoughts (called “Monkey Mind” by Buddhists). As irritating as this can be, it’s actually a good thing—it means that we are beginning to process our stress and getting to a point where we can truly practice mindfulness (Bielkus, 2012). Yoga’s gentle flow from one position to the next is a perfect opportunity to cultivate the ability to stay present. The transitions mimic the changes we experience as we go from working to resting to cooking to cleaning to sleeping and everything else in between. If the breathing exercise above sounds helpful, you might want to try some other exercises intended to boost your mindfulness and sense of present moment awareness. These 5 exercises are some good ways to get started. This simple exercise is a great way to get yourself in a mindful mood and get in touch with your body. Doing this in the morning can also help you get your day off to a good start. While sitting or lying down on your bed (just make sure not to fall asleep if you try this lying down! ), take a few deep, mindful breaths. Notice the way your breath enters and exits your lungs. Starting with your toes, focus your attention on one part of your body at a time. Pay attention to how that area is feeling and notice any sensations that you are experiencing (Scott, n.d.). After a few moments of focused attention, move up to the next part of your body (i.e., after your toes, focus on your feet, then ankles, then calves, etc.). This is not only a good method for putting you in a mindful state right off the bat, it can also help you notice when your body is feeling differently than normal. You might catch an injury or illness that you wouldn’t normally notice, just by taking a few minutes each morning to scan your body. You can learn more about the mindful body scan and other exercises here. Here’s how to use your journal as a stepping block to a more mindful day. Early in the morning, before you’ve headed off to work or school or started checking things off your long to-do list, take a few minutes to pull out your journal or a notebook and make an entry. “Morning Pages are three pages of longhand, stream of consciousness writing, done first thing in the morning. There is no wrong way to do Morning Pages—they are not high art. They are not even “writing.” They are about anything and everything that crosses your mind—and they are for your eyes only. Morning Pages provoke, clarify, comfort, cajole, prioritize, and synchronize the day at hand” (Cameron, n.d., as cited in Scott, n.d.). Whether you follow Cameron’s guidelines or not, taking just a few minutes to write down any mindless “chatter” in your head or log any particularly insightful dreams can clear your head and help you start your day off in a mindful state. Visualizing your goals is an excellent method for not only making it more likely that you will follow through on your goals, it can also help you become more mindful on a regular basis. When you have set your daily goals (see #15 – Define Three Daily Goals on this list if you need help with this piece), take a few moments to visualize each one (Scott, n.d.). See yourself undertaking each goal and completing each goal today. Get as much detail as you can in your visualization, so it feels real and within your reach. When you can see yourself checking that daily goal off your list, move on to the next goal and repeat until you have visualized all of your daily goals. Practicing visualization of goal completion can not only help you improve your focus and mindfulness, it can also lower your stress, improve your performance, enhance your preparedness, and give you the extra energy or motivation you might need to accomplish everything on your list. Taking advantage of the natural beauty around us is another good way to cultivate greater mindfulness. The next time you feel the need for a walk—whether it’s a quick trip around the block or a lengthy stroll through a pretty, scenic spot—make it a mindful nature walk. It’s pretty simple to make any walk a mindful walk; all you need to do is engage all your senses and stay aware of what’s happening both around you and within you. Be intentional with your awareness; notice your feet hitting the ground with each step, see everything there is to see around you, open your ears to all the sounds surrounding you, feel each inhale and exhale, and just generally be aware of what is happening in each moment. This exercise helps you not only connect to your authentic self, but it also helps connect you to your environment and improves your awareness of the beauty that’s all around, just waiting to be found. Add these benefits to the known benefits of walking regularly—lowered stress, better heart health, and improved mood—and you have one handy exercise! It can be easy to get tired and worn out by the end of the day and let things slip. To help you keep that mindful tone at the end of the day, try this exercise. Towards the end of your day, perhaps after you finish all of your “must-dos” for the day or right before heading off to bed, take a few minutes to do a review of your day (Scott, n.d.). Think back to the start of the day and remember your mindfulness exercise that kicked it all off. Think about how it made you feel. Think through the rest of your day, being sure to note any particularly mindful moments or memorable events. Take stock of your mood as you moved through your daily routine. If you want to keep track of your progress towards greater mindfulness, it’s a great idea to write all of this down in a journal or a diary; however, the point is to give yourself yet another opportunity to be mindful and end your day on the right note. One of the best tools to keep yourself in the present moment is meditation. Any meditation will do, but there are some meditation practices geared specifically towards present moment awareness. 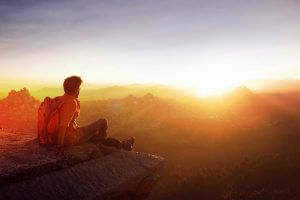 Set aside a regular block of time during your day (e.g., 5 minutes first thing in the morning or before you go to bed). Get in a comfortable position—but not too comfortable! You don’t want to fall asleep when you’re trying to meditate. Sitting upright may be the best posture. Set up an “inner gatekeeper” to control what comes in and what must stay out of the mind. Instruct the gatekeeper to keep out any thoughts of the past or the future for the rest of your current practice. Turn your attention towards the sounds you hear. Allow them to wash over you and focus only on the current sound you are hearing, not the one you just heard or any sound you may hear next. Focus on your bodily sensations: your arms resting on the arms of a chair or on your lap, your legs on the chair or folded up underneath you, the feel of your clothing on your skin, any pain or muscle aches, any twitches or flutterings, and any other sensations you might be feeling. Turn your focus to the thoughts going through your head. Observe them as they enter your mind, swirl around your consciousness, then exit your mind. Let each thought pass, labeling them as they go (e.g., “hurt” or “happy”) and keeping your mind open for the next thought to arise. Finally, focus on your breathing. Notice your natural breathing pattern and take note of how your chest rises and falls with each breath (Henshaw, 2013). Although mindfulness meditation is a pretty broad catch-all term for the types of techniques that help you be more mindful and more committed to the present moment, there are some specific kinds of mindful meditations that you can try. Basic mindfulness meditation: focusing on your breathing, a word, or a mantra and allowing thoughts to come and go without judgment. Body sensations: being aware of bodily sensations like itching, tingling, soreness, or a tickling sensation and accepting them without judgment, then letting them pass. Sensory: being aware of what you are seeing, hearing, smelling, tasting, and touching without judgment, then labeling them and letting the sensations pass. Emotions: allowing emotions to be present in yourself without judging or trying to neutralize them; practicing the naming/labeling of the emotions and allowing them to arise and letting them go just as easily. Urge surfing: coping with cravings by accepting them without judgment, noticing how you feel as they hit, and reminding yourself that they will pass (HelpGuide, n.d.). If you find yourself struggling to use these techniques or implement these tools and tricks, and/or if you are dealing with a diagnosed mental disorder like depression, anxiety, or obsessive-compulsive disorder, present moment psychotherapy may be just what you need. Present moment psychotherapy is like any other type of therapy, but it adds a twist with its focus on present moment awareness. As therapist and founder of Present Moment Psychotherapy & Coaching Adrienne Glasser states, present moment psychotherapy is about “regulating our nervous system through an integration of traditional therapeutic modalities with modern, experiential modalities and meditation” (n.d.). You may find this focus on being present and mindful to be a powerful complement to traditional, evidence-based methods of treatment. To check out our comprehensive list of the top 50 mindfulness books, click here. I hope you’ve enjoyed this piece and learned something that you can apply in your own life to help you cultivate a better sense of mindfulness. If you take just one thing home from reading this piece, make sure that it’s this: being mindful is extremely easy! Yes, it takes work and effort to create a sustained mindfulness practice, but it’s incredibly easy to take a pause and be mindful at any random moment throughout the day—like right now! If you don’t have the time or the energy for any of the more involved exercises right now, that’s okay. Simply stop a few times a day and take a mindful moment. The more you do it, the better you’ll get at being mindful, and soon it will be second nature to you. What are your thoughts on living in the present? Do you have any tips or tricks to share? What do you find are the most impactful benefits of living in the present? Let us know in the comments! Truly excellent summary and synopsis of the complexity and wealth of information out there on this subject. Very helpful to me. Thank you very much. One tip I heard from Eckhart Tolle was “When you realize that you’re not in the present moment, you become present.” or something like that. Great article!! Thanks for sharing these insights and tips! Remembering to focus on and take stock of All You Do Have and less about what you don’t!